The best corned beef in Cleveland is at Slyman's. You could go to slymans for pastrami, roast beef, or turkey sandwiches, but don't waste too much time on these other sandwiches. You should just get a corned beef sandwich. 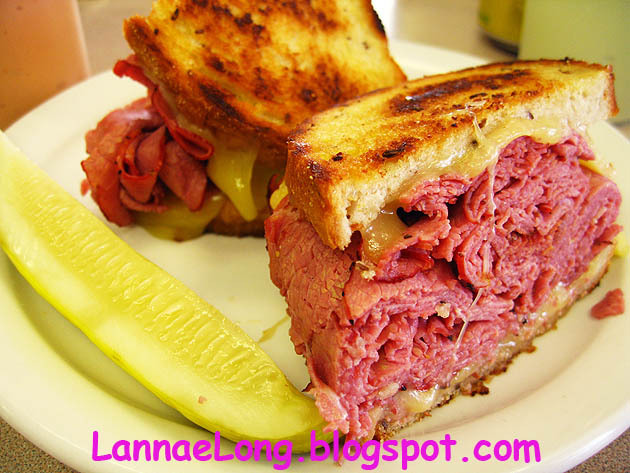 If you attempt to order something else besides corned beef, listen to your diner waitress when she says, "Honey, we have the best corned beef in the world, would you like to try one of our corned beef sandwiches?" Your answer should be yes to the corned beef sandwich. "Man on the street interview"
I got tipped off to try Slyman's by Pete, who used to live in Cleveland. I need to get more Cleveland food tips from Pete because he has never steered me wrong. Slyman's does have the best corned beef I have had in my adult life. It is so good, that I brought home a pound of the good stuff and that is what we have been eating for lunch everyday since I have gotten back. Here is a tip for you travelers: I take gallon and quart sized ziplock baggies with me when I travel. I never know when I need the baggies. Sometimes I need them to transport my liquids on a plane, sometimes I need them to take leftovers back home or to the hotel room. This time, a gallon ziplock was needed to take home a pound of this hearty corned beef. On this day at Slyman's, I got a Reuben which is a toasted rye bread sandwich with a little kraut, and melted Swiss cheese and piled high with corned beef. The sandwich line is going non-stop. They guy slicing the meat did not stop slicing for the whole hour I was there. This shop has this deal down pat, it did not take more than 3 minutes to get my order. The waitress came around with 1000 island dressing on the side, if I wanted it. There is a big cup of horseradish on all the tables to enhance the sandwich if you want it. I decided to mix a little 1000 island dressing with a scoop of horseradish to use on my sandwich. I had to use a fork and knife to start eating the sandwich because it was too tall for me to eat with my hands. The corned beef isn't overly salty like the cheaper stuff sold in chain grocery stores. It has a nice briskety texture, moist and tender. 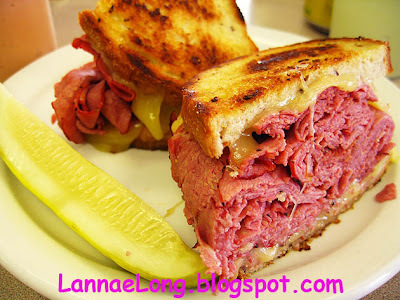 The Swiss cheese, horseradish and the nice toasted bread complimented the corned beef. Also on this day, Cleveland News Channel 5 stopped in to get the opinion from the "man on the street" about the upcoming Ohio State U football game. Apparently, as the locals were saying, it is rather common for news crews to come to Slyman's to get the opinions from the "man on the street", and it is possible to get a news crew there every week. My suggestion is, if you fly in and out of Cleveland, take a small soft side insulated lunch box and a ziplock baggie. Go get yourself some corned beef and carry it on the plane in the baggie and lunch box. Apologize to your airplane neighbors for the corned beef smell, and tell them it is corned beef from Slyman's. Then the airplane neighbors will ask you for a taste of the corned beef because they know how good Slyman's is. Eh, you better get a pound and 1/2 to take with you so you can share the corned beef with the airplane neighbors, and still have a pound of corned beef when you get home. Excellent, so glad you made it!! I'm drooling now just thinking about that corned beef. Pete, thanks so much for the tip because the corned beef is so dang good! Any other suggestions you may have, let me know. I love eating in Cleveland! It's certainly the best I've had anywhere. Lucky's Cafe makes some interesting locally sourced food. Their mac & cheese is really something to experience. It's in the Tremont area...about 5 or so minutes away from downtown, if that. They really shine in the brunch department if you make it out on a weekend.